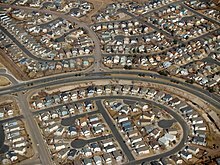 Part of the built environment: suburban tract housing in Colorado Springs, Colorado. In social science, the term built environment, or built world, refers to the human-made surroundings that provide the setting for human activity, ranging in scale from buildings to parks. It has been defined as "the human-made space in which people live, work, and recreate on a day-to-day basis." The "built environment encompasses places and spaces created or modified by people including buildings, parks, and transportation systems." In recent years,[when?] public health research has expanded the definition of "built environment" to include healthy food access, community gardens, mental health, "walkability", and "bikeability". Early concepts of built environment date to Classical Antiquity: Hippodamus of Miletos, known as the "father of urban planning,"[by whom?] developed Greek cities from 498 BC to 408 BC that created order by using grid plans that mapped the city. These early city plans eventually gave way to the City Beautiful movement in the late 1800s and early 1900s, inspired by Daniel Hudson Burnham, a reformist for the Progressivism movement who actively promoted "a reform of the landscape in tandem with political change." The effort was in partnership with others who believed that beautifying American cities would improve the moral compass of the cities and encourage the upper class to spend their money in cities. This beautification process included parks and architectural design. By mid-century modernist "indifferent" design influenced the character of work and public spaces, followed by what Alexander describes as a late twentieth century "revival of interest relating to the concept of place (including the built environment), and its relevance to mental health and other fields of study." Currently, built environments are typically used to describe the interdisciplinary field that addresses the design, construction, management, and use of these man-made surroundings as an interrelated whole as well as their relationship to human activities over time (rather than a particular element in isolation or at a single moment in time). The field is generally not regarded as a traditional profession or academic discipline in its own right, instead drawing upon areas such as economics, law, public policy, public health, management, geography, design, engineering, technology, and environmental sustainability. Within the field of public health, built environments are referred to as building or renovating areas in an effort to improve the community's well-being through construction of “aesthetically, health improved, and environmentally improved landscapes and living structures”. For example: community forest user group in Nepal is multidimensional institution, which serves goods and services to the communities through natural resource management (see Climate change adaptation in Nepal). Technology is playing a pivotal role in shaping the industries of today by augmenting processes, streamlining activities, and integrating innovations to propel the functioning of companies and organisations across a multitude of industries and help them achieve new heights. Building information modeling (BIM) is prominent practice. It involves illustration & pre-execution overview of physical and functional characteristics of places. BIM tools help the planner in making a future ready informed decision regarding a building or other built asset. Smart Building Management, Drone-based Surveying, 3D Printing, Intelligent Transportation System are recent implementation of technology in modern built environment. A separated bike lane in New York City. To implement walkable neighbourhoods, community members and local leaders should focus on policy development. An effective framework that has been utilized in an abundance of communities is the Complete Streets concept of community planning that has been developed by the National Complete Streets Coalition (NCSC). NCSC states that the most successful policies are those that reflect input from a broad group of stakeholders, including transportation planners and engineers, elected officials, transit agencies, public health departments, and members of the community. According to Riggs, 2016, policies may focus on a “Complete Streets” investment, which includes sidewalk bulb-outs and refuges to reduce crossing distances or street widths for pedestrians. Other investments should include installing crosswalks, road markings, benches, shelters and sidewalk art installations. Every community will have a unique method of policy development depending on whether it is an urban, suburban, or rural community and how the policy will combine the variety of transportation modalities. Communities may choose to focus on walkability, but will also need to consider biking, wheeling/rolling, driving, and emergency vehicles. The NCSC policy workbook gives descriptive guidance on how to proceed with policy development whether they be council-driven, council-approved, directives, or citizen vote. When deciding how to proceed with walkability policy development, considerations should be made regarding current and past transportation policies, local community and government support, and how transportation policies have been implemented in the past. A community garden located in Montreal, Canada. Access to healthy food is also an important component of the built environment. A higher density of convenience stores has been associated with obesity in children. In contrast, improved access to community supermarkets and farmer's markets is correlated with lower overweight status. Specifically in low income neighbourhoods, the presence of a local grocery store is correlated with lower BMI/overweight risk. Community gardens are also considered a part of the built environment, and have been shown to increase fruit and vegetable intake among gardeners. Scholars say that community gardens have also been shown to have positive social and psychological impacts that lead to lower levels of stress, hypertension, and an improved sense of wellness, affecting the overall health of the individual and the community. The intersection of public health with other disciplines is evident in the design process of built environments which includes environmental planning, policy development and land-use planning. Research suggests that people are more active in mixed-use communities or those that incorporate retail and residential and densely populated areas as well as those with good street connectivity. Those who preferred to walk and live in walkable environments often have lower obesity rates and drive less compared to those who preferred living in auto-dependent environments. Built environments containing recreational facilities have been associated with greater physical activity among children. For example, one study found that walking paths, parks with playgrounds, swimming areas, basketball courts and other various recreational facilities increased physical activity among adolescent girls. Urban planning and its utilization of mixed use development are key factors affecting childhood obesity. Mixed use spaces are composed of residential, commercial, cultural, and institutional components. This type of development helps to reduce the distance residents have to travel to access a grocery store or school. It also creates a more walkable and bike friendly environment for residents. It has been proven that high-density environments, meaning mixed use spaces and neighborhoods with higher walkability and bikeability, will increase physical activity. A multivariable cross-sectional study done by the Harvard School of Public Health examined the association of walkable built environment characteristics with body mass index (BMI) scores among a large sample of children and adolescents. Eight geographic information system variables were used to characterize a walkable built environment. (1) A distance less than 15 km to a private or public recreational open space has been linked to an increase in physical activity among children. This may be due to the influence children have on one another when they see others playing. (2) Also, a higher number of open spaces increases the likelihood of physical activity among children. (3) A more densely populated residential area can increase children’s proximity to their peers creating a more walkable environment. (4) Less traffic density can also increase physical activity among children because their parents feel safe when they are walking in the neighborhood. (5-7) Lower neighborhood speed limits with more sidewalks and intersections also create a safer environment for children increasing their likelihood to walk in the neighborhood. (8) Finally, a greater variety of land use mix, or mixed use spaces, result in more children walking. These built environment characteristics that can increase walkability were found to be generally associated with a lower BMI scores among the children sampled. Another study looking at active commuting, those reporting walking, biking, or skateboarding to school more than three times a week, among elementary aged children had significantly lower BMI than non-active commuters. For these reason, mixed use lands within the built environment are imperative to helping address childhood obesity. Urban sprawl, which has been positively associated with increased obesity, and an overall decline in active transportation in recent decades presents a real need for improving health within the built environment. High-density environments bring schools, parks, and grocery stores closer to residents making it convenient to potentially eat healthier foods and exercise on a regular basis. Comprehensive urban planning, such as mixed use development, promotes healthier lifestyles in general. The strength of the evidence for reducing obesity through environment has been highlighted by the Center for Disease Control in its Common Community Measures for Obesity Prevention Project, which includes measures of healthy food access and physical activity environments. ^ a b Roof, K; Oleru N. (2008). "Public Health: Seattle and King County's Push for the Built Environment". J Environ Health. 75: 24–27. ^ "The City Beautiful Movement". Retrieved 26 April 2012. ^ "Architecture: The City Beautiful Movement". Retrieved 22 April 2012. ^ Alexander, Donald (2008). "Physical determinism, modernism and mental health". Environments (35 no.3). hdl:10613/2722. ^ "The Built Environment and Health: 11 Profiles of Neighborhood Transformation". Retrieved 12 April 2012. ^ a b Renalds, A; Smith, T; Hale, P (2010). "A Systematic Review of Built Environment and Health". Family and Community Health. 33 (1): 68–78. doi:10.1097/fch.0b013e3181c4e2e5. PMID 20010006. ^ a b Carlson, C; Aytur, S; Gardner, K; Rogers, S (2012). "Complexity in Built Environment, Health, and Destination Walking: A Neighborhood-Scale Analysis". J Urban Health. 89 (2): 270–84. doi:10.1007/s11524-011-9652-8. PMC 3324613. PMID 22350512. ^ "Walk Score Methodology" (PDF). Archived from the original (PDF) on 11 May 2012. Retrieved 30 March 2012. ^ a b c "Complete Streets local policy workbook, Smart Growth America". ^ Riggs, William (2016). "Inclusively walkable: exploring the equity of walkable housing in the San Francisco Bay Area". Local Environment. 21 (5): 527–554. doi:10.1080/13549839.2014.982080. ^ Horacek, TM; White AA; Greene GW; et al. (2012). "Sneakers and spokes: an assessment of the walkability and bikeability of U.S. postsecondary institutions". J Environ Health. 74 (2): 8–15. PMID 21949979. ^ Cochrane, T; Davey, R (2008). "Increasing uptake of physical activity: A social ecological approach". J R Soc Promot Health. 128 (1): 31–40. doi:10.1177/1466424007085223. PMID 18274328. ^ Grafova, I (2008). "Overweight Children: Assessing The Contribution Of The Built Environment". Prev Med. 47 (3): 304–308. doi:10.1016/j.ypmed.2008.04.012. PMID 18539318. ^ Rahman, T; Cushing RA; Jackson RJ (2011). "Contributions of built environment to childhood obesity". Mt Sinai J Med. 78 (1): 49–57. doi:10.1002/msj.20235. PMID 21259262. ^ Zick, C; Smith, K; Fan, J; Brown, B; Yamada, I; Kowaleski-Jones, L (2009). "Running to the store? The relationship between neighborhood environments and the risk of obesity". Soc Sci Med. 69 (10): 1493–500. doi:10.1016/j.socscimed.2009.08.032. PMC 2791711. PMID 19766372. ^ Litt, J; Soobader, M; Turbin, M; Hale, J; Buchenau, M; Marshall, J (2011). "The influence of social involvement, neighborhood aesthetics, and community garden participation on fruit and vegetable consumption". Am J Public Health. 101 (8): 1466–73. doi:10.2105/ajph.2010.300111. PMC 3134498. PMID 21680931. ^ Heath, G; Brownson, R; Kruger, J; et al. (2006). "The effectiveness of urban design and land use and transport policies and practices to increase physical activity: a systematic review". J Phys Act Health. 3 (s1): S55–S76. doi:10.1123/jpah.3.s1.s55. PMID 28834525. ^ Frank, L; Saelens, B; Powell, K; Chapmen, J (2007). "Stepping towards causation: Do built environments or neighborhood and travel preferences explain physical activity, driving, and obesity?". Social Science & Medicine. 65 (9): 1898–1914. doi:10.1016/j.socscimed.2007.05.053. PMID 17644231. ^ Sallis, James F.; Floyd, Myron F.; Rodriguez, Daniel A.; Saelens, Brian E. (February 2012). "The Role of Built Environments in Physical Activity, Obesity, and CVD". Circulation. 125 (5): 729–37. doi:10.1161/CIRCULATIONAHA.110.969022. PMC 3315587. PMID 22311885. ^ Cohen, Deborah A.; Ashwood, Scott; Scott, Molly M.; Overton, Adrian; Evenson, Kelly R.; Staten, Lisa K.; Porter, Dwayne; McKenzie, Thomas L.; Catellier, Diane (November 2006). "Public Parks and Physical Activity Among Adolescent Girls". Pediatrics. 118 (5): e1381–9. doi:10.1542/peds.2006-1226. PMC 2239262. PMID 17079539. Retrieved October 29, 2018. ^ "Planning and Community Health Research Center: Mixed Use Development". American Planning Association. 2013-02-07. Archived from the original on 2013-02-07. Retrieved October 29, 2018. ^ a b c d e f g h i j Duncan, Dustin T.; Sharifi, Mona; Melly, Steven J.; Marshall, Richard; Sequist, Thomas D.; Rifas-Shiman, Sheryl L.; Taveras, Elsie M. (December 2014). "Characteristics of walkable built environments and BMI z-scores in children: evidence from a large electronic health record database". Environmental Health Perspectives. 122 (12): 1359–65. doi:10.1289/ehp.1307704. PMC 4256697. PMID 25248212. ^ a b Rosenberg, Dori E.; Sallis, James F.; Conway, Terry L.; Cain, Kelli L.; McKenzie, Thomas L. (September 2012). "Active Transportation to School Over 2 Years in Relation to Weight Status and Physical Activity". Obesity. 14 (10): 1771–6. doi:10.1038/oby.2006.204. PMID 17062807. ^ Lopez, Russ (September 2004). "Urban Sprawl and Risk for Being Overweight or Obese". Am J Public Health. 94 (9): 1574–9. doi:10.2105/AJPH.94.9.1574. PMC 1448496. PMID 15333317. ^ Kahn, LK; Sobush K; Keener D; et al. (2009). "Recommended community strategies and measurements to prevention obesity in the United States". MMWR Recomm Rep. 58 (RR-7): 1–26. PMID 19629029. Jackson, Richard J.; Dannenberg, Andrew L.; Frumkin, Howard (2013). "Health and the Built Environment: 10 Years After". American Journal of Public Health. 103 (9): 1542–1544. doi:10.2105/ajph.2013.301482. PMC 3780695. PMID 23865699. Leyden, Kevin M (2003). "Social Capital and the Built Environment: The Importance of Walkable Neighborhoods" (PDF). American Journal of Public Health. 93 (9): 1546–1551. doi:10.2105/ajph.93.9.1546. PMC 1448008. PMID 12948978. Archived from the original (PDF) on 2017-10-18. Retrieved 2014-02-26.